Barahir (S. ‘Tower-lord’), son of Bregor, was the father of Beren and chieftain of the First House of the Edain (FA 455-60). As a child, his people moved from their home in Estolad and relocated to Ladros (Dorthonion); but Morgoth soon waged war upon the Eldar and the Edain. Dorthonion was overrun in the Battle of Sudden Flame, and it was during this battle that Barahir saved the life of the Elven-king Finrod. 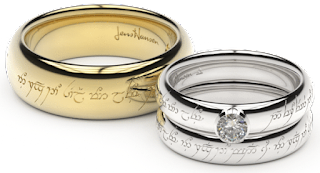 In return, Finrod gave him his ring and pledged his friendship to Barahir’s House and kin. But Morgoth continued to pursue Barahir, who had set up a camp by the Tarn Aeluin with twelve other companions. Their location was eventually disclosed to Sauron by Gorlim, who so longed to see his wife again that he allowed himself to submit to the enemy’s lies. Of the twelve outlaws, only Beren escaped the slaughter; he later crept into the enemy’s camp and reclaimed the hand and ring of Barahir, which had been taken as a trophy.